Satifying Customer's Countertop Needs Since 1979!! 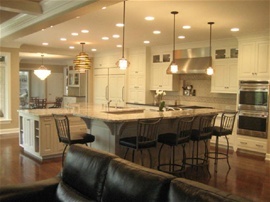 We are a Professional Countertop Design, Fabrication and Installation Company. We use the latest CNC equipment and Design Software to provide Our Customer's The Best Countertop Results Possible. How Can We say This, Well Our Customer Say So, and Keep Recommending Other to Us!! We are Currrently looking to Hire Experienced Professional Fabricators, & Installers..
Big Saw goes Down for Repair, and fixed.. Back To Work!! More Blacks,Greys, and white Colors being Chosen than Ever! !